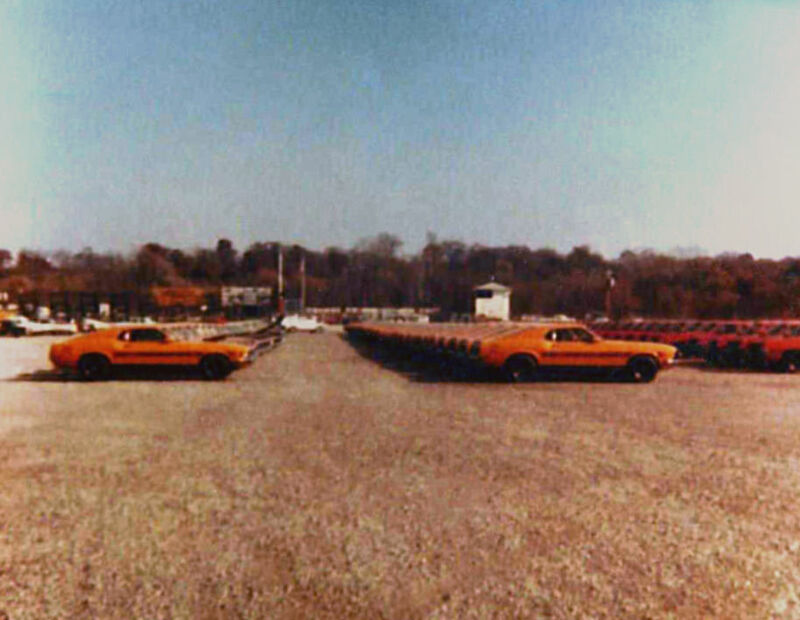 The Mustang and Torino Twister Special cars debuted for the Total Performance Day at the Kansas City, MO district sales office on November 7, 1969. Another photo submitted to us by Craig Prouty shows the cars from a different angle. Professional touchups by reddit's /u/marked_blue. ﻿Think you have a Twister Special? Complete the form below and I'll get back to you as soon as possible! The new twisterspecial.com has VIN listings for ALL Twisters produced. We can verify yours is a true original. As the creator of the original Twister Special Registry, Terry Fritts, would have wished, please understand that this is a service and a hobby provided by me and not a business. All the costs of research, documentation, and hosting of this web site have been borne by me. I am always happy to assist non-owners with email questions about their cars. If I do not have an answer, I may be able to redirect you to someone that does. I'm excited to be finally building a site dedicated to my dream car! Being the proud owner of a 1970 Torino Twister Special I have always been fascinated by these vehicles and interested in their stories. From barn finds to daily drivers to the drag strip I'm ready to share all the information I can find on these amazing machines. Browse through the links and check back often to see new updates and click the MAIL icon in the top left corner to send in additional photos or information you might have about other Twisters! Apologies to the Twister owners that I've contacted in the past few months for not getting the site up sooner to showcase their beautiful automobiles. Everything I can find on these vehicles is up and posted now and those credits go to their respective authors cited next to their work. Added TONS of info about the 1970 Ranchero Twister Specials. More updates, cars added, and emails checked and updated. I've spent many hours painstakingly transcribing the Documentation tab at the top and it is finally complete. Also, we've got so many cars now that I had to reorganize the Registry Vehicles tab at the top to make navigation easier! Keep 'em coming! Today marks 10% completion of the New Twister Special Registry. Of the 298 Twisters spread across the years, we now have 30 confirmed VINs online. I continue to hear from more and more owners as time goes on and now I've got PRIOR owners contacting me as well! Exciting! As always, any information I get on a specific car gets added to its page, even if the info comes from past owners. Also, a big thanks to whatever Facebook group linked to my site this St. Patty's day weekend - when I normally average 30 unique viewers a day I received 1900 people checking it out instead which was pretty cool. I can't see who it was specifically but thanks a lot! 567 unique visitors and 968 page views on September 25th - the day the news of the Ranchero Twister Special broke. That's sure to be an all-time high for our little site: I'm glad you all can be a part of the work I intend to maintain for years to come. With all the traffic came a few things that I'd like to clarify - the Twister Special trademark was obtained by R&A Motorsports when they built the 22 - 2008 Twister Special Mustangs. I would like to place the disclaimer that I am in no way affiliated with them or their trademark at a business-level but what we do here to continue the historical education, documenting, and commenting on these rare cars is purely to keep the spirit of our vehicles alive in the eyes of the public. It is an honor to talk to each and every owner that gets in touch with me and I'm glad to be of service to the group. Keep 'em coming! The "Official" Web Site For The 1970 Mustang Mach 1, 1970 Torino Cobra, 1970 Ranchero, 2008 Mustang GT Twister Special's and 1985 Mustang GT Twister II's. For the last eleven years of his life Terry Fritts spent a great deal of time tracking down information on one if his favorite past times - The Twister Special. Both him and his father each owned one of these cars, making them the only father and son pair to be documented in doing so. Terry was referred to as "Mr. Twister" by Mustang Monthly magazine and "The World's Foremost Twister Special Authority" by Automotive Photo Journalist Tom Shaw. The original Twister Special Registry website had an amazing array of facts, articles, photos, and invoice copies dating back to 1981 that were collected from the general public, published works, and many of the fans and owners such as yourselves.